Michael Thompson returns to PGA action this week as he is entered into the field at the Shell Houston Open. Play begins on Thursday at the Redstone Golf Club in Houston, TX. Michael's 1st round tee time is at 2:00, the latest of the day. "Great guy. Great player. Well... That's a given. And oh, he hits it 30 by me. Big hitter! " The Shell Houston Open provides PGA Tour players several "last minute" opportunities to improve their year. For some players the Shell Houston Open provides one last opportunity to get ready for the Masters. For the rest of the field, it provides one last opportunity to get invited into the Masters field since they have a "win and your in" policy for the full field tournaments that precede the Masters. In addition, this tournament is also the last "open" PGA Tour event before the next reshuffle, which will take place after the Masters is complete. Rumors have it that Michael will have a strong following in Houston as brother Zach is hoping to sneak away from the Air Force for a couple of days to catch some of the action. The Louisiana Open came to a close today with Michael Thompson ending up T-66. After a rough third round where he shot 5 over par, he closed out the tournament with a solid even par round. Despite the ups and downs, it sounded like he still enjoyed himself as he posted on twitter: "I played today in 3 hrs 30 min. That's a record for me in a tournament. I love twosomes on the weekend!" Now it's on to Houston where he is currently the second alternate for the Shell Houston Open. That should be good enough to get in though, as several players usually drop out at the last minute due to injury or illness. Michael Thompson dropped some spots to T-34th after posting a two over par 73 (-2 overall) at the Chitimacha Louisiana Open. Despite the setback, his first round score was so good that he still breezed past the cut line which was at even par. He's now made 4 out of 6 cuts for the year. Play continues today when he tees off at 10:44 am local time. Michael Thompson shot a four under par 67 today at the Nationwide Tour's Chitimacha Louisiana Open. His round included 6 birdies, 10 pars and 2 bogeys, leaving him tied for fifth after the first 18 holes of the tournament. "Had the best day of golf so far this year today. I love this game! And there's more where that came from!" Michael Thompson, the 2005 Louisiana Male Golfer of the Year, is set to return to the state to play at the Nationwide Tour's Chitimacha Louisiana Open in Broussard. It's just a three hour drive west from Tulane University in New Orleans, where Thompson received a scholarship to play for the Green Wave. Thompson enjoyed his time playing for Tulane, but all that came to an end when Hurricane Katrina hit and the golf team was disbanded in it's wake. Thompson then went on to play for the Crimson Tide at the University of Alabama, and the rest as we say, is history. The Chitimacha Lousiana Open has many of the PGA rookies playing this week, due to the limited number of spots available at the PGA's Arnold Palmer Invitational. Like the PGA Tour events, the Nationwide Tour is televised on The Golf Channel. often televised on the Golf Channel, but not this week. This week also marks a milestone for Michael and his wife Rachel because she is now traveling with him to the various tournaments. Michael's mom, Beth said that at the last tournament he was playing with a stiff shoulder the final round. Considering Rachel has a Doctorate in Physical Therapy (she met Michael as a freshman at Tulane), her professional talents will come in handy as well as her spiritual, moral, and logistical support as Michael travels across the country. Michael is scheduled to tee off at 12:30 local time on Thursday. Michael Thompson finished his best week on the PGA Tour with a tie for 14th place at the Puerto Rico Open. He completed his fourth round at even par which resulted in a tournament finish at 9 under par. His strong showing earned him a well deserved paycheck and will certainly help his ranking on the official PGA reshuffle list which is used to prioritize players when filling out tournament fields. The nine under par finish was by far his lowest tournament score this year bettering his one under par at the AT&T Pebble Beach Pro Am. It also marked his best performance ever at a PGA Tour event. Previously his best finish was at the PGA Tour's 2008 Valero Texas Open where he finished T-28. Michael will try to take the momentum from Puerto Rico into the Florida swing of the PGA Tour schedule over the next few weeks. Accompanying him for the rest of the season will be his wife, Rachel, who has left the workforce in order to travel with, and support Michael while out on the road. 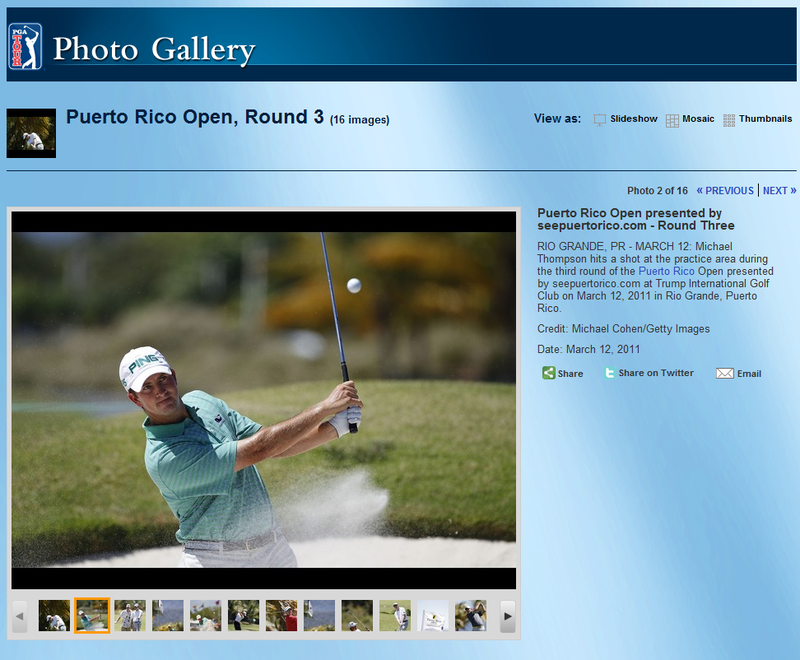 FYI: You can view photos of Michael from the Puerto Rico Open at Getty Images or click on the photo below to view three photos that were included in the PGA website's Photo Gallery for Round 3. Update: Michael climbed from 37th on the reshuffle list to 27th and climbed to 14th on the Rookie Rankings. Way to go! 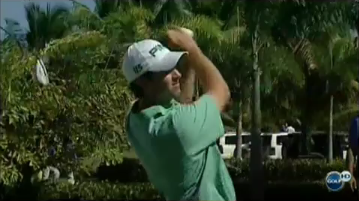 Michael Thompson received his first bit of television time today during the third round of the Puerto Rico Open. They showed him on the 12th, 16th, and 17th holes. You can watch it below. Of particular note, he was sporting the gear from his new clothing sponsor, Vineyard Vines, along with their trademark blue whale logo. They gave quite a bit of background information on him, and spoke highly of him. We can mark this down as #7 of "Signs you know you made it onto the PGA Tour". Michael Thompson's strong play at the Puerto Rico Open continued on Saturday, as he posted a 2 under par 70 to remain tied for 9th place. Unlike the previous two rounds, Thompson played the front 9 for even par, and was finally able to break through on the back 9, scoring 2 birdies along with 7 pars. Prior to the first birdie scored on the back 9, Thompson had pars on 21 of the 22 holes played on that half of the course. One item to note from his statistics is that he's gaining yardage on his drives every round he plays. The first round averaged 265 yards, second round 284 yards, and third round 298 yards. We've noticed his yardage has generally been increasing over the last several tournaments. Michael's final round begins at 11:20am local time (10:20ET). Don't forget to set your clock ahead for daylight savings time. He will once again be paired with Chris Di'Marco. Michael Thompson's hot hand on the front nine holes at the Trump International Golf Club continued today, making 5 birdies on the front 9, besting the -4 he scored yesterday on that half. His solid par play on the back 9 also continued as he shot 8 pars with the one exception being a double bogey on hole 14 where he hit it into a "Native Area" and had to take a penalty stroke. Combined, the two halves left him with a three under par 69, -7 overall. He ended the day tied for 9th, the first time this season he's been in the top 10 at the end of a round. Let's hope he keeps the strong play going tomorrow, and if the birdies start to drop on the back 9 too, watch out! Thompson tees off tomorrow at 11:15 local time (10:15 EST). As the temperature warmed up today, so did Michael Thompson's first round at the Puerto Rico Open. Michael hit 16 of 18 greens in regulation which gave him plenty of scoring opportunities, but the day started with the birdie putts not wanting to fall in as he scored nine pars in a row. Making the turn onto the front nine at the Trump International Golf Club, the birdie putts started to drop. Michael caught fire and scored five birdies, four of which came in the last five holes. The solid golf was tempered by a lone bogey on hole #3, but the strong finish led to a four under par 68 enabling Thompson to climb the the leaderboard at the end of the day, finishing tied for 11th. Michael's second round begins at 8am local time (7am ET) where the morning is forecast to bring a chance of brief showers. Michael Thompson will be playing in Puerto Rico this week as the PGA Tour is holding two events simultaneously. The WGC Cadillac Championship will host 68 players while The Puerto Rico Open will be hosting another 132 PGA Tour players. 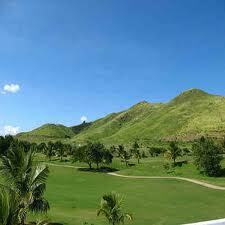 The Puerto Rico Open will be played at the Trump International Golf Club for the fourth consecutive year. Based on Michael's initial response from the venue (via Twitter), he's already a fan. "I love this place! The PGA Tour needs to keep this event going! Awesome!" The good news for Michael is that the PGA Tour has committed to this event at least through 2012. Michael is looking for a little Alabama Crimson Tide Puerto Rican magic. The Alabama men's golf team competed in Puerto Rico in February where they won by 5 shots over second place Georgia Tech. Via Twitter, Michael said "I'm going to dominate like the Alabama Crimson Tide did last month down here! Roll Tide!" Michael starts his first round at 12:40pm local time from the tenth tee on Thursday. (That's 11:40am ET). His second round will begin at 8:00am Friday morning from the first tee.